At times I can be a bit of a rebel. So I said FINE, put back the contact lens drops and hang tight. Grabbed a cart and zoomed around tossing boxes of my contact lens solution in there, the protein removal thingies for contact lenses. Oh, and First Aid IS covered?? Yay! Well, I’ll be damned (probably literally). I tossed in some Hello Kitty bandaids, by God! I adore Hello Kitty and, hey, it’s a covered item! Along with 2 other boxes of bandaids. 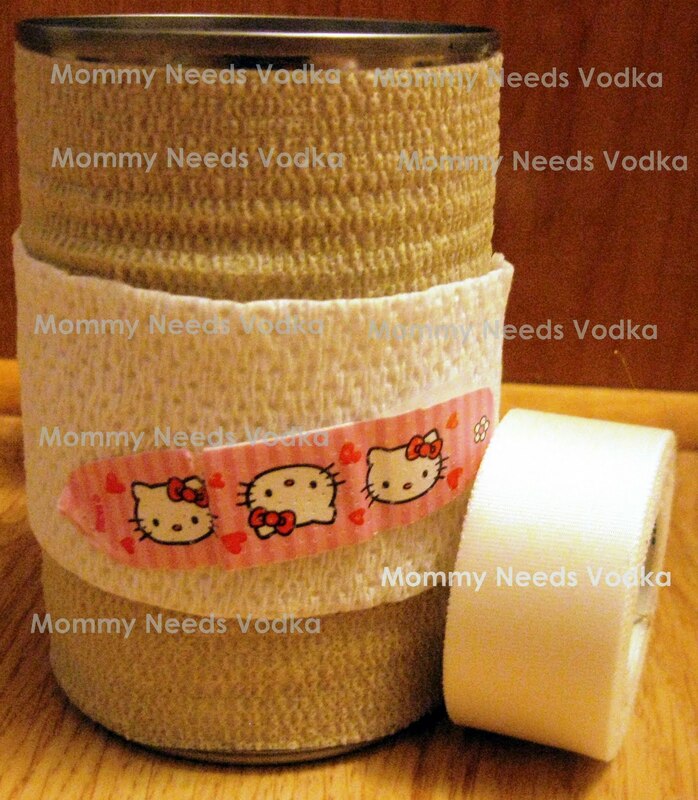 Then they had a 2 for $5 special on that stretchy gauze that goes around wounds so I grabbed those along with some cool white gauze and another “wrap” that, as you can see in the photo, looks like white grosgrain ribbon but with the benefit that it sticks, so I can use it for crafts. I’ll be getting some more of that if there’s still a balance on my card at the end. Okay, so the Hello Kitty bandaid doesn’t quite go with the rest of this awesome pencil cup holder that y’all will be pounding down my door to try to purchase. But this is just an idea of the potential: First Aid care for crafts! I’m gonna run with it, especially if I have to pay for half my contact lens solutions and Excedrin for migraines, which works better than my lousy prescription (which obviously IS covered). But, seriously. Taking Topomax had me losing 10 lbs per week and once I had no feeling in my hands, I had to go off it. Excedrin + another prescrip works better. Give us back our OTC bennies and quit this charade, already. We’re still paying for it out of our paycheck, and this is only forcing people to get prescriptions rather than OTC stuff that works better. Result = drives up the price of insurance. Then you get some bitter nut-jobs like me who plan to tie-dye First Aid gauze and make crafts just cuz we CAN. Next, perhaps dressing up a spring wreath….